We are delighted to announce that The Rev’d Dr Mark Smith has been appointed Dean of Clare College, as successor to The Rev’d Dr Jamie Hawkey. His appointment will commence on 1 January 2019. Mark read History at Peterhouse and worked as a school teacher after graduation, before returning to Cambridge to train for ordained ministry. Alongside his curacy, Mark wrote his doctoral thesis, analysing the proceedings of church councils in late antiquity. Since 2015, he has been Chaplain & Director of Studies in Theology at Christ’s College, Cambridge. Mark is also an Affiliated Lecturer at the Faculty of Divinity, where he lectures, supervises, and conducts academic research in early church history. He is married to Phillippa, and they have two young daughters. In his spare time, Mark enjoys playing snooker and pool, and opens the batting for the Ely/Norwich Diocese cricket team. 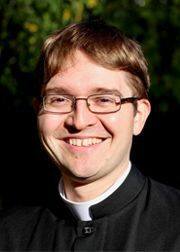 The Bishop of Ely, the Rt Rev’d Stephen Conway, said: “I’m delighted that Mark has been appointed as Dean of Clare. His considerable gifts as a priest and scholar, and his warm and friendly character, will enable him to serve the whole Clare community with dedication and distinction”. The Master of Clare, Lord Grabiner, said: “I’m sure that all Fellows and members of the College will want to join me in congratulating Mark on his appointment, and we look forward very much to welcoming him here in January. It is evident that he has done a fantastic job as Chaplain at Christ’s and he will make a wonderful addition to the academic and Chapel community in Clare."